Heat milk in heavy bottomed pan for 30 - 45 Minutes on a low flame, until it reduces to 300 ml. Let the milk cool for 10 minutes. 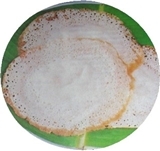 Add maida, sugar and powdered cardamom and make a batter with dropping cosistency (like appam) without lumps. Take spoon full of batter and drop in hot oil. Deep fry, till golden brown in colour.